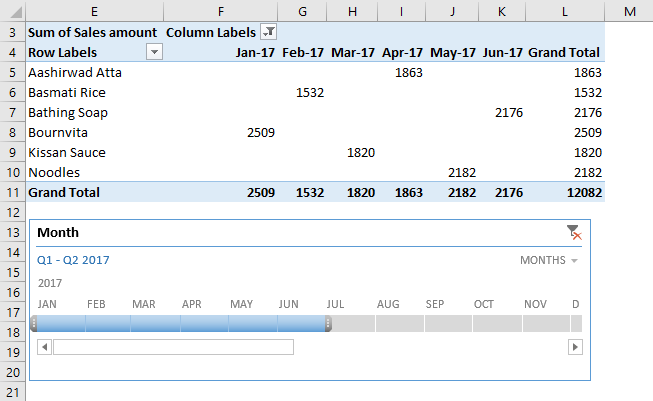 Timeline in Excel (Examples) | How To Create Timeline in Excel? 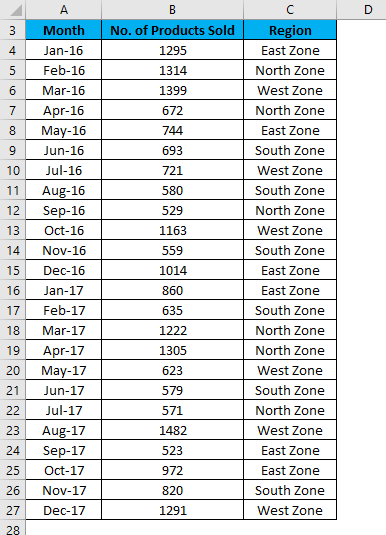 How to Create Timelines in Excel? 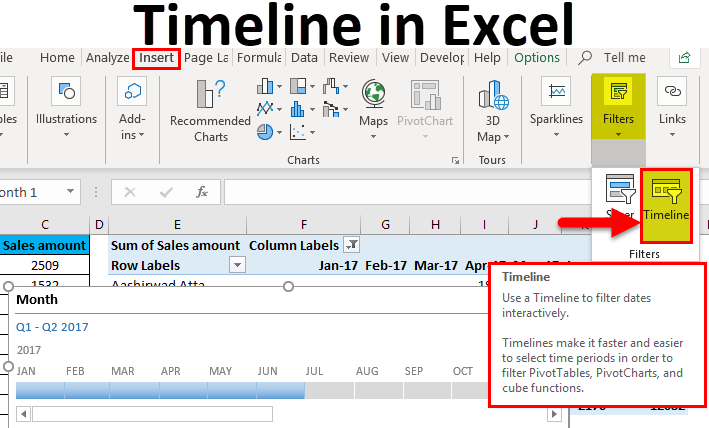 A timeline feature in Excel is specifically designed to filter data based on time. This feature doesn’t work at times. 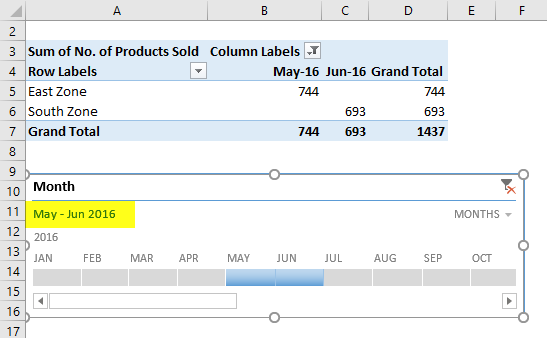 An excel timeline is basically used with Pivot tables to filter data based on dates. 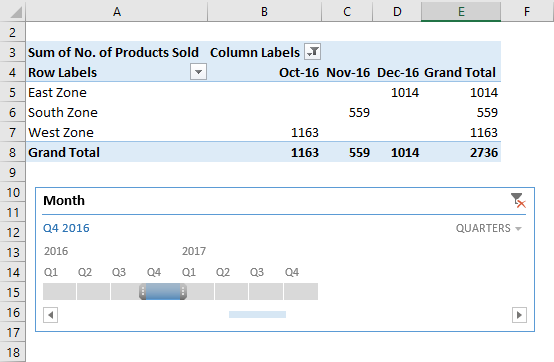 While working with Pivot Tables, you must have observed many times that with the default filters in Pivot table, it’s very difficult to filter the data in months, quarters etc. The timeline filter provides you the best solution for this. This feature is only useful when a pivot table has a file that is formatted as a date. For adding the timeline feature in Excel, you must have a pivot table first. 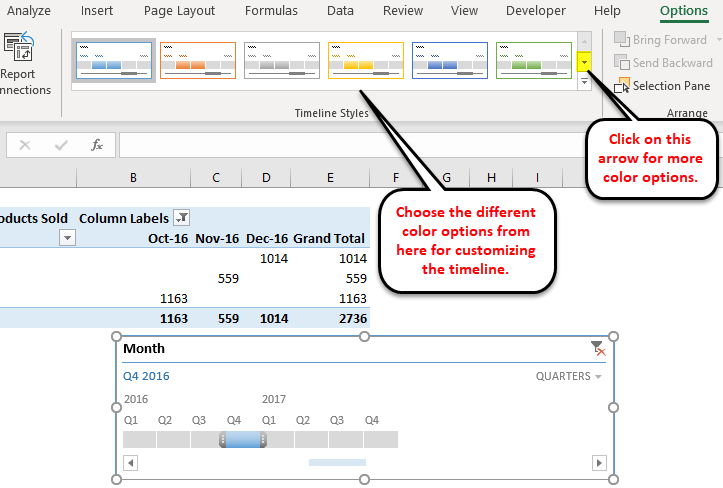 Let’s understand the working of creating timelines in excel with some examples. 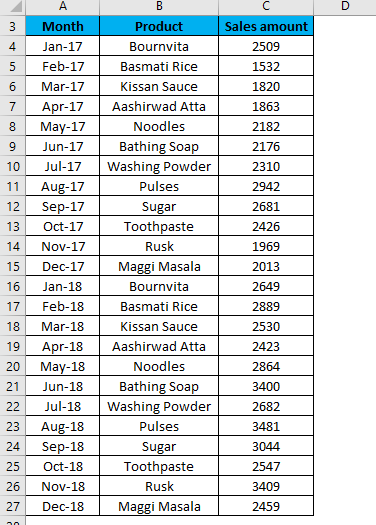 We have given a list of a number of products sold region wise and month wise. First, create a Pivot table for the given data. Click on any cell in the table and go to the Insert tab. Click on Pivot Table option under Tables section. 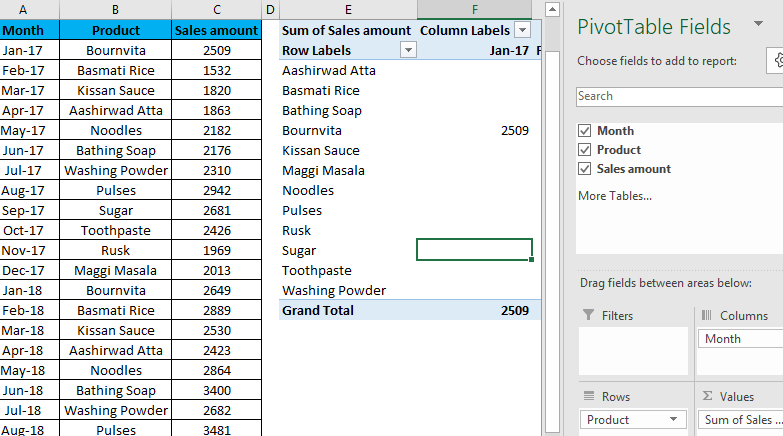 Now the Pivot table is created as shown in below screenshot. 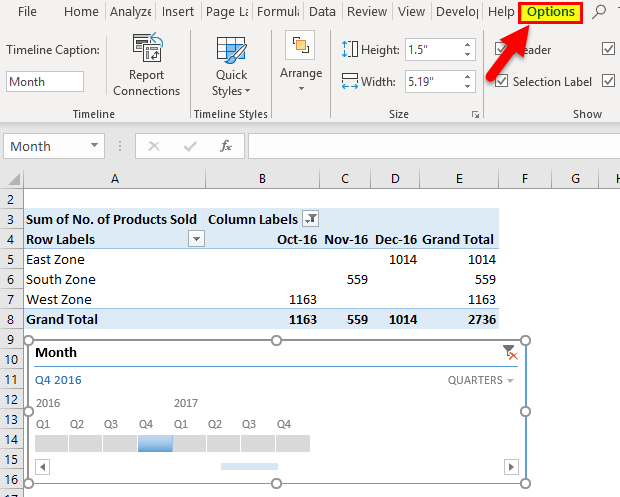 Click anywhere in the Pivot table and go to Insert tab. Click on Timeline filter under Filters section. Refer below screenshot. It will open an Insert Timelines dialog box. Refer below screenshot. 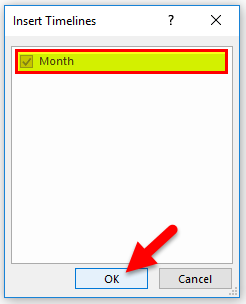 Click on Month checkbox inside the dialog box and click on OK. 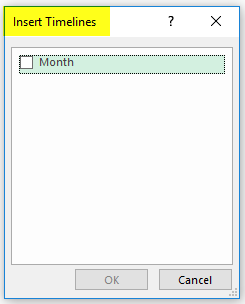 It will show you the timeline and by default, it’s showing the month’s data year wise. Refer below screenshot. Now with the help of this timeline, you can arrange the records in the Pivot table by adjusting and clicking. Refer below screenshot. 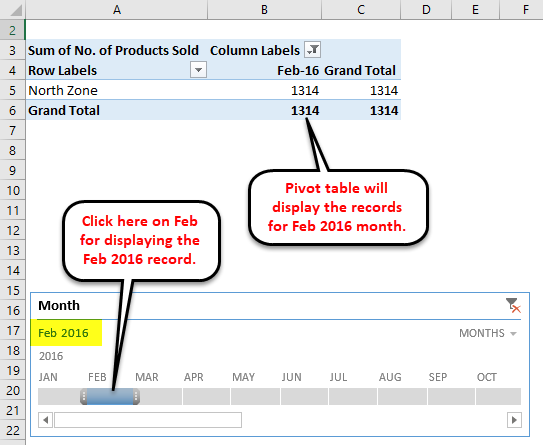 In the above screenshot as we can see that we have clicked on Feb month under the 2016 year it is displaying the data accordingly in the Pivot Table. If you want to see the data for a continuous month then you need to drag the bar across those months like below screenshot. We have selected the data for May & June 2016 month. We also can see the data day, quarter and year wise. For this click on the drop-down arrow on timeline box as shown in below screenshot. Choose another date component like Quarters. If you want to remove the timeline from the data, then click on the icon on the upper right corner like shown in the below screenshot. You also can use shortcut key ALT+C for this. Click on Timeline window. Go to the OPTIONS tab. Click on any color option under Timeline Styles section as shown in below screenshot. You also can change the size of the timeline window. You can change the name of the timeline window by clicking on Timeline Captions under the Timeline section. Let’s take another example of a grocery shop. Now we will create a table for the above data. Here, we are inserting the pivot table in the same sheet with data set. As we can see that we have clicked for 6 months result (from Jan – June) of the year 2017. Hence, you can select the months accordingly by clicking on this timeline bar. 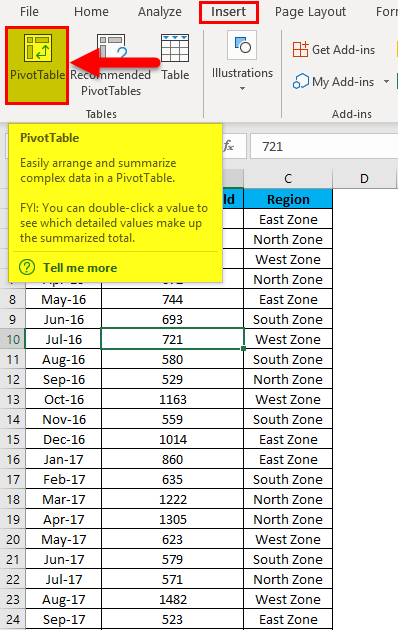 If your Pivot Table doesn’t have a field formatted as a Date, Excel displays an error. 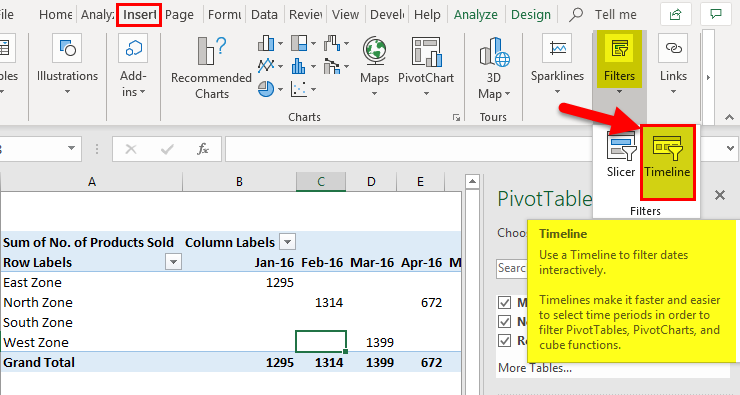 A timeline is useful for filtering the data in the Pivot table very quickly.